Explore your city with visits to places of interest in or near London. We'll walk a bit as well, and learn about the history, architecture, topography and people that make London the fascinating place it is. At least one visit a month, on different days and times, to avoid always clashing with the same iU3A groups. Visits cover all of Greater London. 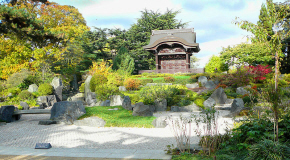 Monthly trips include visits to historic houses, museums, galleries and churches. Please email me (see above) to join the group. Members are advised of forthcoming visits by email and sign up (by responding to the email) for each visit in advance on a first come, first served basis. Individual visits may be limited to 10-20 members depending on the destination. To keep things simple (!) for me, I'll open booking for each visit about a month before the date and if numbers are limited I'll let you know. Please note that many visits require payment of entrance charges. Some events are free, but many require a payment for an entry fee or guided tour. When an event is 'pay on the day' please have the correct money with you, in an envelope with your name on it as this is the best way of checking who has paid and who has not! If I ask for payment in advance it should be by cheque made payable to ‘Islington U3A’ and sent to me, or by electronic payment direct to iU3A’s account. Email me if you need more information. If the visit is ticketed, I will ask for a stamped, addressed envelope from you so I can send you your ticket/s. Help wanted! Our group is getting larger, and I'd be grateful for any offers of assistance with event planning, and group leading, especially as we seem to need repeat visits now to accommodate as many 'Explorers' as possible. If any of you would be free to join me for a cup of coffee, tea or a glass of something stronger, depending on when we decide to meet (!) to 'brainstorm' about this, it would be great. Just email me if you are willing and we’ll come up with a day/time to meet. Events from March to July 2019: Here is our programme of the Events which are scheduled between March and July 2019, with a couple of NEW events added. April event lists have just been sorted out and successful applicants for places have been notified; any further applicants are welcome to go on the waiting lists — email me. Look out for the events (2 June, 6 June) where you need to book your own tickets, and/or let me know if you plan to go. Otherwise, events are open for booking only when you get an email from the Coordinator saying that you can sign up, there isn’t a link from our web-page. Keep checking your inbox! Wednesday 24 April at 11am — back to King’s Cross for a guided walk to see the newest developments. This will be our third visit and it’s been so interesting to see how the site has changed in the years we’ve been going back. It will be a free event and the group size will be limited to 20-25. Booking open now — waiting list only. Wednesday 15 May at 11.30am and 2.30pm — Fashion and Textile Museum, Bermondsey to see ‘Swinging London: A Lifestyle Revolution’. As we lived through the ‘swinging sixties’ it seems an appropriate visit somehow! Two time-slots for a maximum of 20 in each group have been pre-booked because it’s not a big venue and when you sign up you’ll be asked whether you have a National Art Pass or not as it will affect the entrance fee — £4.50 if you have a National Art Pass, £7.50-£8 if you don’t. Booking opens in April. Sunday 2 June from 10.30am to 4pm — Family Open Day at Crossness Pumping Station. The Pumping Station is opening again, now the asbestos has been removed, and on this Sunday it’s open all day and the ‘Prince Consort’ pumping engine will be in steam. On these ‘Open Days’ there is a shuttle bus service from Abbey Wood Station, otherwise it’s not the easiest place to reach. The entrance fee is £8. Again this will be a ‘book yourself visit’ but I will ask you in May to let me know if you plan to go, so that you can look out for each other! NEW Thursday 6 June at 10.30am — Back to the Postal Museum. If you haven’t been before, this is another chance to visit the Postal Museum at Mount Pleasant with U3A friends, especially as entry to the Museum is free with a National Art Pass! A fellow-Explorer pointed out that there is a new temporary exhibition ‘Voices from the Deep’ featuring a cache of letters recovered from the wreck of the SS Gairsoppa, torpedoed off the coast of Ireland in 1941. If you want to add ‘Mail Rail’ to your visit, there’s a top-up fee of £6.25 if you have the Art Pass. Regular museum entry costs £9, or £15.40 with ‘Mail Rail’. See www.postalmuseum.org for full information and booking. Go ahead and book as soon as you like for tickets, I’ll ask who is coming in May. NEW Friday 28 June — a day out for Explorers in Rochester. This year the destination for our 'away-day' is Rochester as it’s a relatively easy train trip out from St Pancras and I had a great day there last year! Details will be firmed up when the summer train timetable is available but this is the rough idea: Rob Smith (who has done walks for us in St Albans, Hackney and Hoxton) will meet a group at Rochester Station for a 1½-2 hour walk through the town (£9 per person, 20 in the group), ending at Rochester Cathedral and highlighting en route many of the venues you might want to return to in the afternoon. We’ll have lunch in the cathedral café, where we can meet up with any Explorers who don’t want to do the walk, and then in the afternoon we can return to the places of individual interest — Rochester Castle, the Huguenot Museum, Restoration House — or one of the biggest second-hand book stores in England! Rob has also pointed out that on Friday afternoons there are hour-long boat trips on the Medway which would just fit in with our schedule. Booking, with full details, will open in early May. 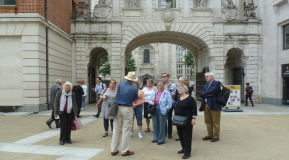 NEW Tuesday 9 July at 11am or Wednesday 17 July at 2pm — a guided walk around Smithfield, led by City Guide Jill Finch, whose previous walks for us have included the Guildhall area, the Great Fire of London and ‘Historic Pubs’. This time we’ll explore Smithfield and detour to the site where the new Museum of London is being developed. The walk will cost £9 per person, and the group size will be limited to around 20 on each day. Booking opens in June, when you can specify the day/time you prefer. At Keats House a programme of events is beginning to mark Keats’ moving into the house and culminating with the 200th anniversary of his death in 1821. You’ll find links to the Keats House info via www.cityoflondon.gov.uk. If you are still in the mood, the exhibition at the Dickens House Museum is ‘Food glorious food: dinner with Dickens’ and it’s on until April 2019! www.dickensmuseum.com. 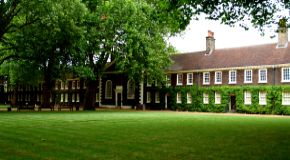 The ‘Gentle Author’s’ blog on Spitalfields Life is fairly well-known as a great source of ideas of places to ‘explore’ but I’ve also found another blog ‘A London Inheritance’ recently and I’d recommend that one too. It’s not a daily posting, but has some great pieces to read. Just google it and you should find where to sign up — I did! April — Westminster Abbey: 8 April saw a group of rather damp ‘Explorers’ joining the queues lining up outside Westminster Abbey as it opened at 9.30am to admit the first visitors of the day. What a contrast between the groups shuffling along the guided route and the airy spaces of the newly opened Queen’s Jubilee Gallery in the Triforium! Our report has been compiled to give three different views of the visit here, and Rachel’s blog here is enhanced by images courtesy of Westminster Abbey so it’s possible to get some idea of our impressions. Photography by visitors is not permitted in the Abbey — but there are one or two attractive postcards on sale in the shop! 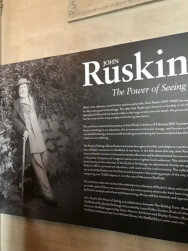 March — Two Temple Place: At the end of March, 'Explorers' made their annual visit to Two Temple Place where the 2019 exhibition was 'Ruskin: the Power of Seeing', part of this year's celebration of the bicentenary of John Ruskin's birth. Two Temple Place exhibitions are proving increasingly popular each year, and we had to make a group booking to be guaranteed access. Although it was busy inside it wasn't so crowded that the group were unable to appreciate the exhibition and explore the impressive building. Pauline F's report here gives a flavour of both, and includes photographs she took and some by Joy D too. March — Hand & Lock Embroidery Studios: In mid-March, two small groups of ‘London Explorers’ had the opportunity to visit the fascinating premises of Hand & Lock on Margaret Street, just north of Oxford Street, thanks to Clara C who set up the visits for us. This company specialises in the type of high-end embroidery we recognise from couture shows and diplomatic and military uniforms and much of the hand and hand-guided machine work is still carried out in the London workrooms. Our photo (by Julia) shows our second small group clustered around an embroidery frame in one of the work-rooms as Robert, our guide, demonstrated hand-stitching techniques for us. The company Hand & Lock had its beginnings in 1767, when Huguenot refugee M. Hand set up a workroom making gold ‘lace’ or ‘braid’. Now it is one of the few reminders of the garment trade which flourished in the streets north and east of Oxford Street. Its shop is a source of embroidery requisites and it runs courses for experienced and amateur embroiderers too — and its annual Prize for Embroidery encourages international designers and practitioners. Explorer Rachel’s blog is here and it gives full details of the first group’s visit and much more information about the company. See also www.handembroidery.com. A small group of ‘Explorers’ discovered the new HQ for the Institute of Physics on Caledonian Road in the afternoon of March 5, and were given a tour of the building by the Head of London Outreach, Louise Swan, before sitting down to watch the video installation Time Tries All Things by Grace Weir. The IOP’s new £30m purpose-built HQ was opened in autumn 2018 and for the first time gave the Institute spaces which are accessible by general visitors, in line with its emphasis on developing outreach programmes of public benefit, as well as serving its members. Visitors are welcome between 9.00am and 7.00pm every week-day; in the reception foyer you will find a cloud chamber which demonstrates cosmic rays naturally occurring in the atmosphere, and a huge interactive video screen where visitors can explore science topics. Smaller rooms will be offered to physics-based start-ups, while larger rooms can be booked by community groups. The IOP’s engagement with local schools and colleges is already impressive — Gillespie Road Primary School’s art works are on display in the foyer and ‘A’ level students of City and Islington College are co-operating in a European-wide project! Downstairs the gallery space currently shows Grace Weir’s ‘dual screen video installation … a poetic meditation on the conceptions of time’ while — in another initiative which blurs the boundaries between art and science — the Institute has co-operated with the Orchestra of the Age of the Enlightenment in a concert series Bach, the universe and everything. The IOP’s website is www.iop.org and is well-worth ‘exploring’! 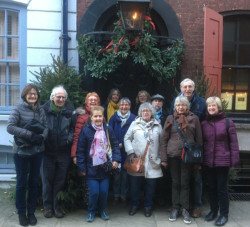 Over two visits on 12 and 21 February to the Salters' Hall, n early 60 ‘Explorers’ were able to tour the modern hall of The Salters’ Company, located just off London Wall on the edge of the Barbican. The recently refurbished building, originally designed by Sir Basil Spence, with David Hicks working on the interiors and garden, is a fine setting for the Worshipful Company of Salters, ninth in precedence in the ‘Great Twelve’ of City Livery Companies. The newly planted open spaces around St Alphage’s ruined tower make this a very attractive part of London now. 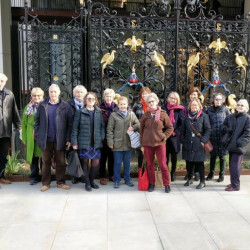 Click here for Rachel’s blog of her visit and here for Brenda’s report — both were in the group on 12 February who were photographed in front of the Hall’s gates. Our main January visit was a tour of the Grade 2* listed Old Vic Theatre on Saturday 12 January. 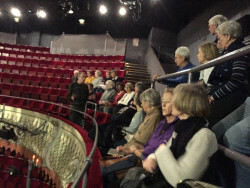 Twenty members were able to tour front of house and backstage — and as Rachel's detailed report shows (here) — learn so much about the building's history and its place in the development of the national ballet, opera and theatre companies from Ned, the guide. The photo (taken by Julia) shows Ned and our group in the 'Gods'. The December visit, with a festive touch, was to the Dennis Severs House on Folgate Street in Spitalfields while it is decorated for Christmas — a popular choice with many Explorers, some of whom had been hoping to visit for years. Our party were let into the house in groups of 10 — here’s the last group waiting patiently outside in the cold! Read Judith's report here. November was a busy month for Explorers: on the 20th, 23 Explorers, in two groups, visited the Victorian premises of the Kirkaldy Testing Museum on Southwark Street just behind the Tate Modern. Run entirely by volunteers, it’s a venue well-worth visiting on its open days. See www.testingmuseum.org.uk, and read Jill’s report here. On November 5th we visited Goldsmith's Hall. Report by Norman Willson with photos by Gilbert Vieri here and you can also see Rachel's blog here. For a summary of visits (January 2016 to October 2016) click here. For details of our visits in iU3A year 2017/2018 look here. For details of our visits in iU3A year 2016/2017 have a look here. Or if you are interested in reading about our even earlier visits in 2015 then have a look at our archive here.